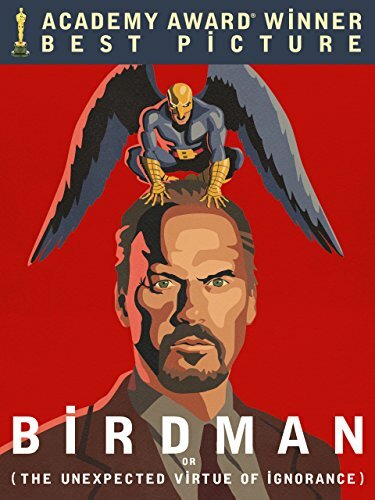 Buy Birdman cheaply from Amazon. You too can earn money from writing articles by signing up for InfoBarrel. In Birdman or (The Unexpected Virtue of Ignorance), Riggan Thomson (Michael Keaton, Need for Speed, RoboCop) is a Hollywood actor who is most famous for his role as the superhero Birdman in three films twenty years prior. He has a dream to appear in a play on Broadway, and to that end has written an adaptation for the stage of Raymond Carver's book What We Talk About When We Talk About Love. Not only has Riggan written the adaptation, he is also directing the play and starring in it, and has financed it too. Riggan's daughter, the practically manga-eyed Sam (Emma Stone, The Amazing Spider-Man, The Amazing Spider-Man 2, Zombieland), who is just out of rehab, is working as his assistant - something that she doesn't enjoy doing. His put-upon best friend Jake (Zach Galifianakis, The Hangover Part II, The Hangover Part III) has also been dragged in to help out. When one of his initial actors, Ralph (Jeremy Shamos), who Riggan thinks is rubbish, is hit on the head by a falling stage light, he gets another actor, Mike Shiner (Edward Norton, The Bourne Legacy), a popular Broadway actor and a guaranteed audience draw who is liked by the critics, even if he is rather erratic and a jerk in person. Riggan often hears a voice in his head, that of the Birdman character he played in the films. Birdman thinks he should go back to Hollywood and make another film in the series. Riggan also believes he has some superpowers of his own, which actually seem to happen in real life. He is also seeing things that aren't there. When Birdman is talking in his low, gravelly voice, it sounds rather like Batman, which really should not be that surprising as Michael Keaton played Batman in the 1989 film Batman and the 1992 film Batman Returns. Riggan played Birdman on three occasions, rather than the twice Keaton played Batman, but in both cases the last outing was in 1992. Riggan was asked to play Birdman in a fourth film, rather as Keaton was going to play Batman in a third, and even the names of the superheroes are rather similar, so there may be a bit of self-referencing going on there. The actors are a rather dysfunctional group of people and Riggan does not seem to have that strong a grasp on reality given his hallucinations, and they aren't just auditory either. He also faces some problems from the Broadway crowd who look down upon the Hollywood crowd. Matters aren't helped in the preshows - essentially rehearsals in front of an audience - as something goes wrong in all of them. The soundtrack of the film is very drum heavy; most of it is played on drums. You also occasionally see the people playing the drums too, and some of the other instruments when they are used. Galifianakis, for a film that is supposedly a comedy, albeit a black one, is playing a much straighter role than he normally does, although the film doesn't seem to actually have much in the way of humour at all. Birdman is possibly written to appeal to actors and critics more than it is the actual audience (and the trailer is rather misleading).